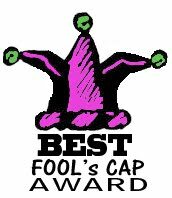 Bookbinding Etsy Street Team: Best Fool's Cap Award Winner! Cindy, aka UsefulBooks, is the 2011 winner of the BEST Fool's Cap Award. Her Inchi Mini Album received the most votes in our recent poll. Cindy's winning entry is an accordion album for displaying inchie artwork. 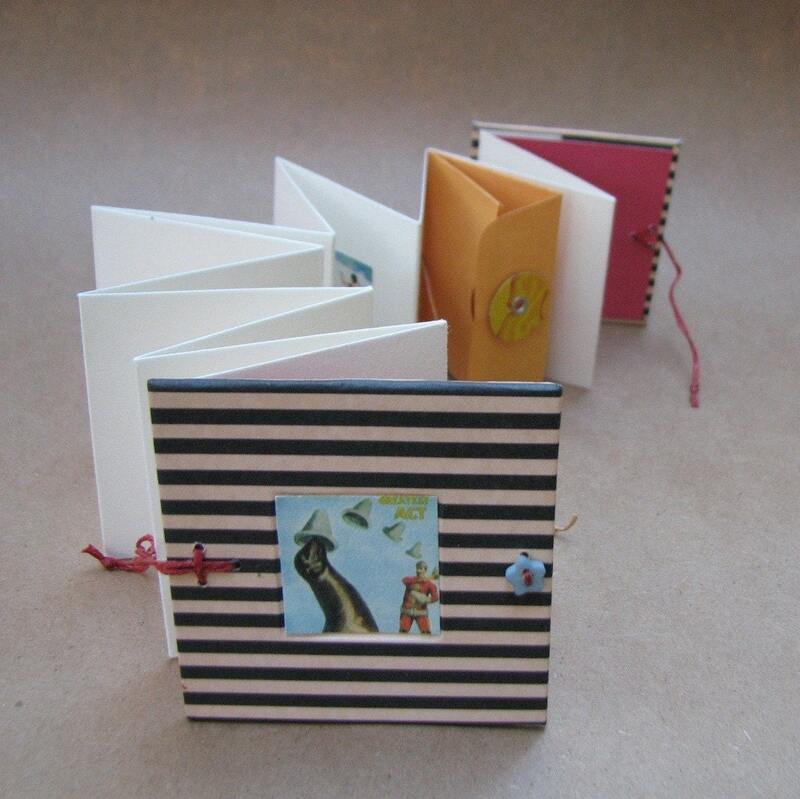 She says, "I have made this album with a bit of a circus theme for the Bookbinding Street Team's Carnival Challenge. The striped paper reminds me of Teesha Moore's circus creations. I've included my own circus themed "inchies" which in my case are just 1-inch squares punched from a digital collage sheet. For now, they're just glued in with temporary adhesive. Let me know, and I will either affix them permanently or remove them so that this will serve as a blank slate for your creations, as the last photo shows." The books is just 2-3/8" x 2-3/8" and it has closures on either size so it opens from both directions or folds out completely for display. Inside will hold 24 inchies perfectly framed on a page, more if you use the endpapers and the envelope. There's a coin envelope trimmed, folded and stitched in to form two tiny pockets for storing extras. This fabulous mini book is available in her Etsy shop! Congratulations! Cindy is hereby awarded the 2011 BEST Fool's Cap award and unlimited bragging rights as the winner of our Carnival challenge. Display your award proudly! Thanks to all the participants and to everyone who voted. Congrats, Cindy! Your book looks wonderful, and the prize is well-earned. It's a lovely little book - so well thought out and structured. I love the pockets and the bright colours and stripes. A well-deserved prize, Cindy - feel free to brag!